“It’s the most wonderful time of the year” however Christmas can be overwhelming for separated families especially those who are experiencing their first Christmas apart. The good news is that you can successfully co-parent at Christmas time however it takes communication, understanding and planning by both parents. In today’s blog, our collaborative family lawyer, Megan Piccardi, shares her tips on successfully co-parenting at Christmas time. Christmas is a magical time of year for children – They are on school holidays, Elf of the shelf is (hopefully) keeping then well behaved and most of all Santa Claus is coming to town! When you are talking to the other parent about Christmas arrangements think about the child’s best interests and try not to let the stress get you down. Remember it is about the child and not about you and your feelings towards the other parent. You should never speak to your child about any issues that you are experiencing with the other parent or make comments how you will be sad that you won’t be with them on Christmas morning. Children should never be incorporated into these adult issues. Most families will split the Christmas holidays up with the child spending Christmas Eve and Christmas morning with one parent and Christmas afternoon and Boxing Day with the other parent. Healthy communication with the other parent is imperative when it comes to making arrangements for Christmas. Communicating with your former partner can be stressful let alone with the emotions of Christmas thrown in the mix it can be easy for conversations to get out of hand. When you are communicating with the other parent, whether it be in person, by email, text message or skype, take a moment to think ‘Is it kind? Is it necessary? Is it relevant’ having this thought process will help keep you on track with the important issues. There are many great apps available to help parents communicate with one another. I highly recommend “The Course” by barrister and mediator, Rachael Hempling. This course has been created to help parents communicate effectively with one another and to help parents make decisions without the intervention of lawyers. At the end of The Course you will have the tools to put together a parenting plan that works for both parents. You can check out “The Course” here. Children love both their parents and they love Christmas! Be understanding and respectful to the other parent wanting to spend time with their child during the festive season. This doesn’t mean that you have to agree with everything the other parent is wanting however you may need to be a bit more flexible than you normally are with changeover times etc…. remember tip number 1 – Think of the best interests of the children. You Have to Have a Plan! Children thrive off consistency and knowing what is happening next. Once you have had discussions with the other parent about Christmas Day make sure that you put it into a Parenting Plan so that both parents have an understanding of the workings of Christmas Day and who is doing what and when. Having a plan will also ensure that there are no miscommunications about what is happening on the day. Separation is hard and spending time apart from your children on Christmas Day is never easy. You may find it helpful to show yourself some self-compassion during this time. If you feel that matters are starting to get overwhelming, you may want to take a self-compassion break. There are many self-compassion meditations available online, Kobie Allison, who recently co-hosted “I Decide my Vibe” a few months ago shares her recording here. Through self-compassion, we acknowledge that everyone experiences pain. We mindfully accept that the moment is painful and embrace ourselves with kindness and care in response. By acknowledging that everyone experiences pain, we allow to hold ourselves in love and connection, giving ourselves the support and comfort needed to bear the pain, while providing the optimal conditions for growth and transformation. Christmas is a special time for everyone in the family and the last place you want to end up is in court trying to get Orders to resolve Christmas custody disputes. Try to attempt to resolve without the need for court. If you are unable to co-parent successfully then perhaps a mediation may be beneficial or speaking to a collaboratively trained lawyer. I can tell you now, you don’t want to be litigating while your child is opening their Christmas presents. 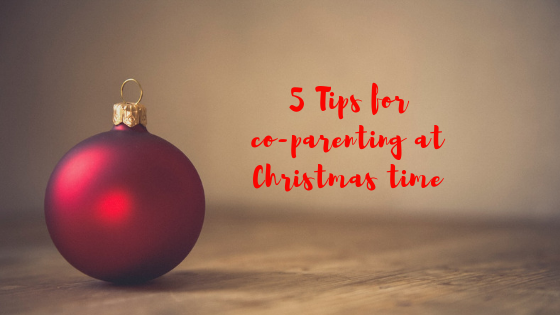 Hopefully these tips will help you successfully co-parent during the festive season. If you have a family law issue that you would like to resolve in a healthy way please get in touch with me here.